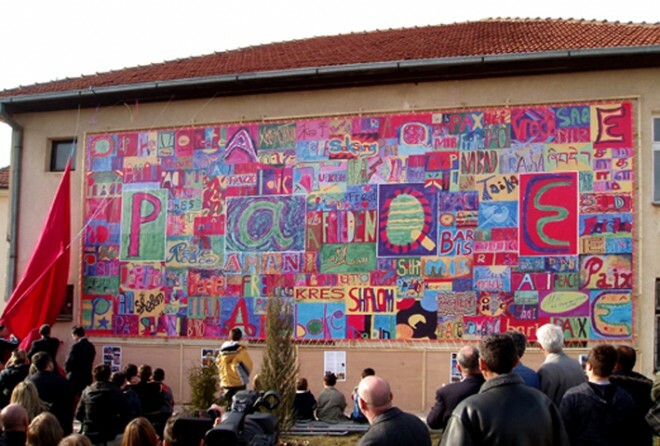 Over the weekend of 28th March 2009 the Peace Banner was unveiled in the centre of Podujevë. At the top is a photo of the finished artwork; below, the unveiling ceremony showing the wall Matt and Stephen attached it to. On the right is a photo of Mandi, Stephen and Matt – Mandi's help was invaluable as his relatives kindly supplied MaK with scaffolding for the two days it took to put it all up. He was also our translator for the project. 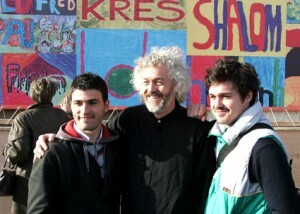 In October 2008 Stephen had gone with Manchester Aid to Kosova to run workshops where participants were invited to paint words for 'Peace'. Using any language and any script the results were 'photoshoped' into an 11 meter wide banner which went on display in the centre of Podujevë to commemorate the dedication of the 22-acre ‘Manchester Peace Park’ in Kosova. The Peace Park was requested in 1999 by children medically evacuated to Manchester who survived the massacre of their family on 28 March 1999 — this was the 10th anniversary of the tragedy. Stephen ran painting workshops with a Women’s Group, local schools (see below), the local Mosque and in Podujevë Town Hall. Back in the UK people from Manchester and the Eden Project in Cornwall made their contributions which were included in the final banner artwork. This project is part of the work of pARTicipate, a collaboration between Stephen and Matthew Raw (http://www.matthewraw.co.uk/index.php?page=participate). If you would still like to contribute to MaK please go to www.makonline.org where your money can be ‘gift aided’. Thank you.